We are located in West Edmonton Mall, on the lower level, between The Bay and the old Sears store (entrances 24 or 16 are the closest). 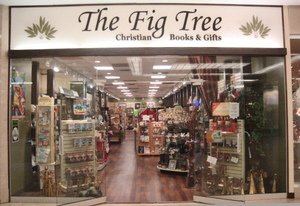 The Fig Tree Christian Books and Gifts has been faithfully serving Edmonton and area for over 10 years. It is independently owned by a family from Spruce Grove who is committed to providing unique and quality Christian products. Come meet our friendly, knowledgeable staff (Nicky, Bethany, Amy, Amber and Anastayia), stroll through our upbeat, family atmosphere and check out our complete collection of the latest in Christian and inspirational items. We carry a huge selection of Bibles in almost every translation and the newest and best in Christian music. You will be sure to find a good read among our Christian literature for adults, teens and kids with sections such as, “Encountering Scripture”, “Your Best Life”, and “Authentic Faith”. Our inspirational gift selection has been called “the best in the city!” We carry home décor such as, pictures, Willow Tree, gifts for baptism and dedication, T-shirts, posters and jewelry. As a Fig Tree Member, you will have the opportunity to receive benefits such as exclusive emailed coupons, Members Only deals, and points toward future discounts. Be sure to ask about our seasonal catalogues for the best deals. You can also find us on Facebook and follow us on Twitter. We take pride in our special order service - we go extra lengths to find the right item and handle each one personally until your item arrives. If it’s out there, we can get it for you! We currently partner with local businesses and organizations such as Shine FM and The Pregnancy Care Centre. We also love to be part of community concerts and we sell tickets to most events. If you would like your event advertised on our website, just send us an email!